That's an additional 93 ponies over the stock version. 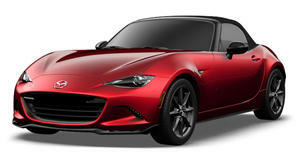 One of the reasons why some are turned off by the latest Mazda MX-5 Miata and Miata RF is due to their lack of power. Of course, the whole point of the Miata isn’t just about power, but lightweight driving purity. However, some extra ponies never hurts, and that’s where UK-based BBR comes in. The renowned Miata tuner has just revealed details of its new Stage 1 turbocharger upgrade kit for the latest Miata (the ND) and the RF. It literally bolts right on to the 2.0-liter Skyactiv four-cylinder engine without any major modifications. Once done, power is increased from 155 hp and 148 lb-ft of torque to 248 hp and 236 lb-ft. The previous 0-60 mph is reduced from about 6 seconds to 5 seconds flat. Top speed remains limited at 155 mph. As for the kit itself, it consists of a new twin-scroll turbocharger that mounts onto a bespoke BBR designed cast-iron twin-scroll manifold. Additional components include a stainless steel downpipe, high-flow lightweight front mounted aluminum intercooler with factory look black intake pipes, lightweight aluminum battery tray, high efficiency carbon fiber turbocharger heat shield, and Starchip EcuTek RaceRom calibration software. What’s nice is that BBR purposely gave all add-ons a factory look, even under the hood, to ensure the Miata’s clean lines. But why didn’t BBR opt for a supercharger instead? "Very early on during development it became clear that use of a supercharger, with its high parasitic losses, would work against the Mazda Skyactiv-G engine’s ultra-efficient ethos. Significant boost levels would be required to deliver considerable power gains with a supercharger, which would be incompatible with the SkyActiv-G’s high compression ratio," stated a BBR rep. So, how much for the extra 100 ponies or so? Just $5,695, and yes, it’ll be available in the US through long established Miata tuner Flyin’ Miata.